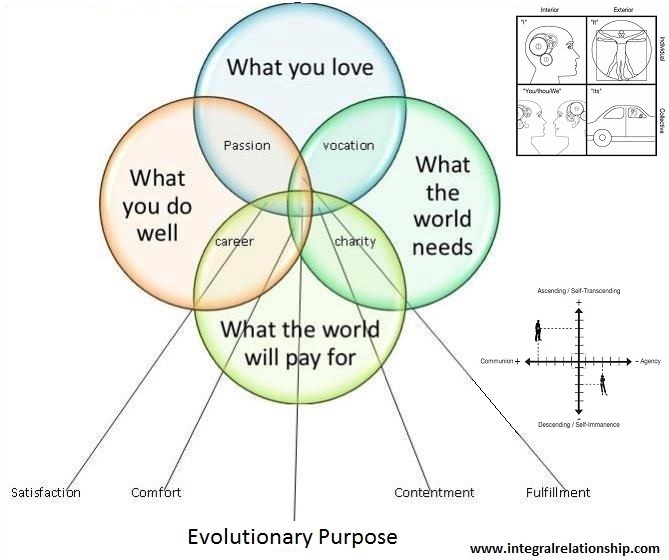 In an Integral Evolutionary Relationship, both partners are at an Integral or higher level of consciousness and share (1) what they love to do/feel called to do, (2) what they do well, (3) what the world needs, and (4) what the world will pay for–their Evolutionary Purpose. These four dimensions correlate with Ken Wilber’s Four Quadrants that are essential to our human existence (small image top right). Realizing our fullest potentials in all four dimensions leads to personal satisfaction, comfort, contentment and fulfillment. Neglecting any of them leads to imbalance, dis-ease, and suffering in individuals, our relationships and the world. Singles sometimes struggle to realize their fullest potentials in all four dimensions because of interior and exterior conflicts and because it is impossible to simultaneously embody feminine and masculine polarities (small image bottom right). Trying to rotate through all four dimensions without the balancing support of a partner or neglecting some of them over longer periods of time can become exhausting and frustrating. Most singles who entered into Integral Relationships report an increase in life quality and contribution. Conventional and postconventional couples often either neglect certain dimensions, or they divide responsibilities between them. 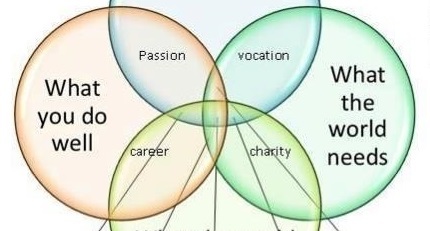 They may both ignore doing what they love or what the world pays them for, or one partner is focusing on whathe or she does well and what the world pays for (career/success), while the other focuses on what he or she loves to do andwhat the world needs (vocation/fulfillment). Even if this is working for some couples, on a global economic and environmental scale we see that this division of rights and responsibilities is not sustainable. If you are single you may want to explore what you love to do, what you do well, what the world needs from you, and what the world will pay for. You can then find/attract a partner at an Integral or higher level of consciousness who shares your Evolutionary Purpose and with whom you can co-create synergy in all four dimensions as opposite and equal partners. Just think about the possibilities of sharing resources, knowledge and your Integral Life Practice with an equal and like-minded partner. Visit www.integralsingles.com to find your perfect match. If you are in a relationship you may have a conversation with your partner how you can realize your fullest potentials in all the four dimensions by co-creating more synergy through equally sharing rights and responsibilities and balancing and harmonizing your feminine and masculine polarities. Make use of the resources on this website to co-create an Evolutionary Relationship.